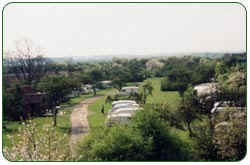 Experience Nottinghamshire camping, Nottinghamshire has a wide variety of camp sites and caravan sites to meet all needs, from small, basic low cost camp sites to large sites with plentiful facilities. Ideal for weekend breaks, Uk central, quiet roads with plenty to do, to longer holidays in peaceful surrounding but never far from the city hubs of Nottingham, Sheffield, Doncaster, Newark or Lincoln. With level grassland in abundance, plenty of space, easy road access for caravanning and central to the UK for groups to meet up, Nottinghamshire is THE ideal location for camping or caravaning. Situated in a quiet unspoiled location offering caravanning and camping, on the outskirts of the old market town of Tuxford, an excellent overnight stop being near the A1, or base for visiting the many attractions around Sherwood Forest. In a mature fruit orchard set in the quiet Nottinghamshire countryside.